Combining my favorite vintage, industrial, and farmhouse elements together to create a unique dining room design for my 1900's fixer upper. Designing a room completely from scratch as I'm doing at my project house can be such a fun process. Guided by the cohesive plan that I came up with for the look of the whole home, I now get to kick back with my laptop and shop for exactly what I need. Trying different combinations of rugs and stain colors for the floor. Imagining different light fixtures hanging overtop my meant-to-be-mine antique table. Deciding just how high I want the baseboards to be in my attempt to take things back to their original character. When you start with absolutely nothing in the room and get to pick each individual piece that will fill the space, it offers up the opportunity to really be intentional about what you want and how each thing will function in the space. Although I prefer to spend time browsing through brick and mortar stores and literally touching the furniture, fabrics, and finishes of the pieces I'm looking at, it is also nice to be able to shop online and do some digital designs to actually be able to see how things can come together. So without further ado, I want to share a few mock ups of my ideas for the space and then will give you my thoughts behind what I'm doing below. 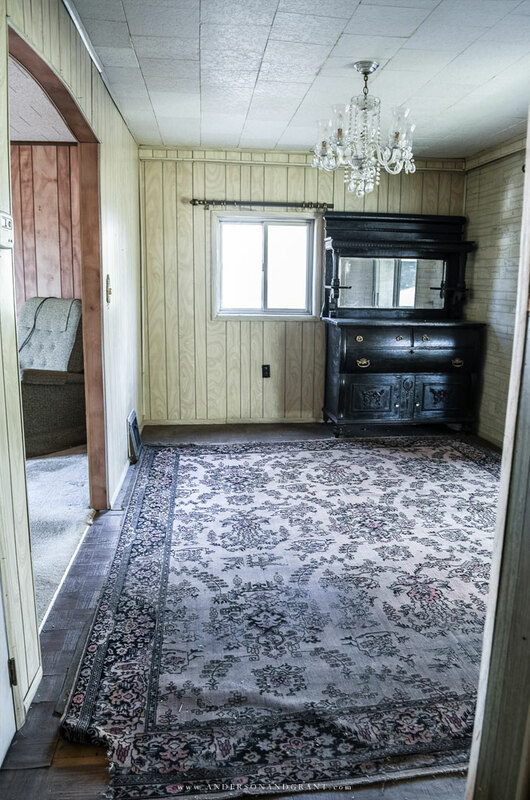 I envision this dining room becoming a gathering space, where extended family can all come together for a holiday and reminisce about when they used to meet up in this same room for special dinners. Keeping that in mind, I want to keep the room pretty open and uncluttered allowing space for the table to be extended and extra chairs added if needed. I also want to keep this room sparce because it receives a lot of great light making it a perfect room for taking pictures for the blog, so I don't want a lot of clutter that needs to be moved around. It is also necessary to have a space where food could be placed giving more room at the table. My plans are to convert the base cupboard that is currently in my "entryway" into a pretty buffet which can also hold entertaining essentials like chargers, platters, and cloth napkins. With a little paint, trim, and new top I think it could I could end up with something even better than the Pottery Barn buffet I have in the picture. 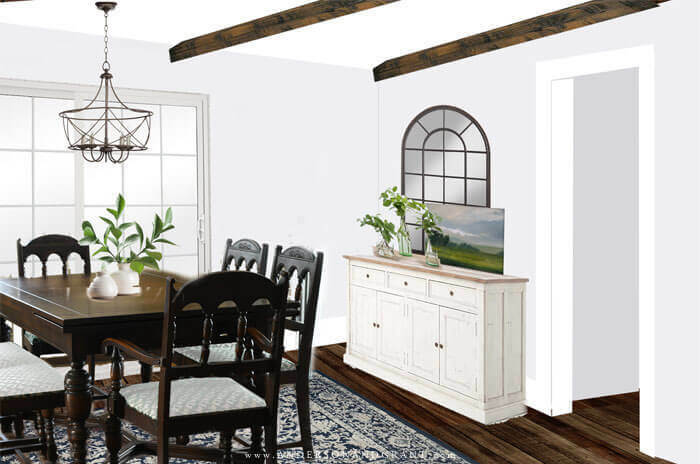 Because I want to keep the two rustic wood beams that flank both sides of the ceiling visible, I also plan on adding a couple more to make them look like they should be there. Any tips on doing this would be much appreciated! For some "art" on the window wall, I'm hoping to be able to reuse the chair backs from the dining table that I wasn't able to restore to make a little architectural salvage to hang. It would be nice to at least get some value out of the table I so hoped was going to work out! After searching I think literally every possible online source I finally found the chandelier that is "the one" from Shades of Light. I think I'm looking more for a black metal finish, but the right shape is the hard part to find. A little spray paint can fix anything if it isn't what I want. And the only other purchase for the room aside from some decor and a mirror is the rug. 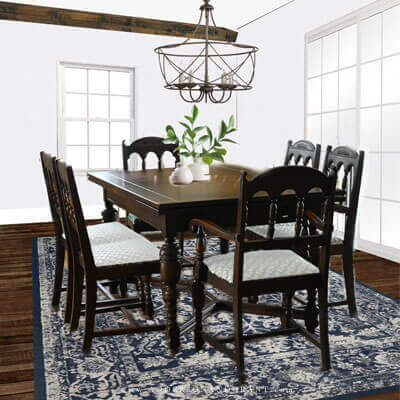 Again, I think I've analyzed every possible rug out there and have settled on a blue Magnolia Home rug. 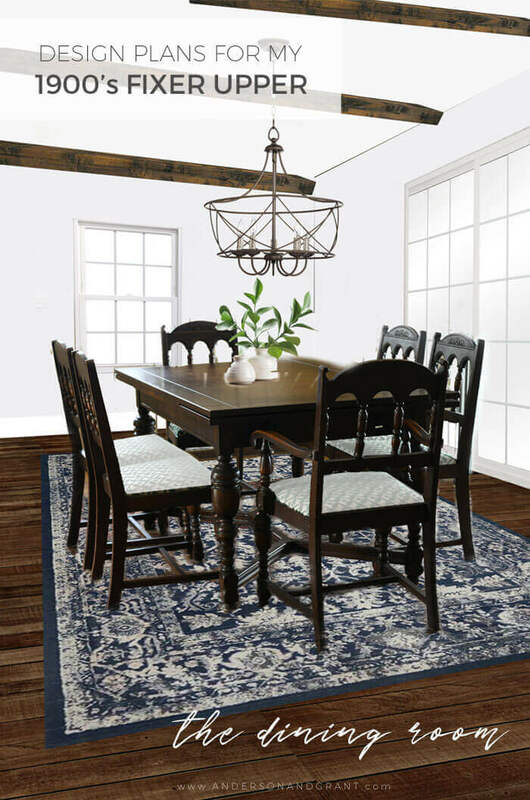 This is where doing a digital design has really helped me to envision what different rugs would look like in combination with the rest of the room. Sizing has also been an issue and thankfully Joanna makes her rug in a variety of measurements. As much as I keep trying to put a name to the style of this room (or the home for that matter), it is hard to do. What I love seems to go into different categories: an antique dining table, slightly industrial chandelier, rustic wood beams. But it all seems to come together into one space that is totally me and I guess that is the important part. I can't wait until I can finally proceed and get started on making this room look like my design plan!